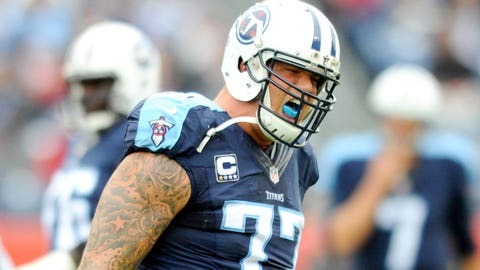 Taylor Lewan was briefly forced out of Sunday's loss to the Falcons after losing feeling in his left arm. The stinger that has bothered Tennessee Titans left tackle Taylor Lewan for nearly a month flared up again in Sunday’s 10-7 loss to the Atlanta Falcons. Lewan briefly left the game early in the fourth quarter after losing feeling in his left arm, but was able to return. Afterward, he said he’s resigned himself to the fact the issue isn’t going away anytime soon, but is committed to remaining in the lineup. The 11th overall pick in 2014, Lewan has started all six games for the Titans so far.